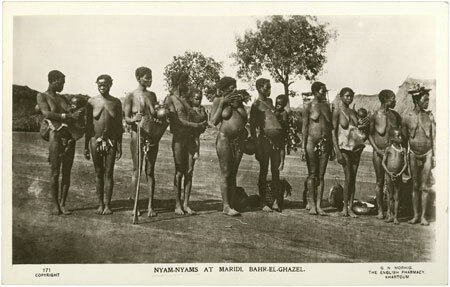 A postcard depicting a line of Zande women, some carrying small children using animal skin carriers. Notes on postcard - "171 Copyright. G.N. Morhig, The English Pharmacy, Khartoum. Nyam-Nyams at Maridi, Bahr-El-Ghazal"
Morton, Chris. "Group of Zande women" Southern Sudan Project (in development). 03 Jan. 2006. Pitt Rivers Museum. <http://southernsudan.prm.ox.ac.uk/details/1998.88.15/>.